From romantic Zionist novels to archeological histories of our ancestral homeland, we most certainly have no shortage of books on the many facets of our land, the Land of Israel. Join the conversation and explore Israel through a wealth of literature, history and personal stories that inspire a lasting connection to our one and only Jewish State. 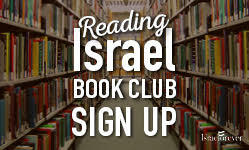 To learn more about the Reading Israel Book Club, click HERE.